CA1 was just over one or two weeks ago. Your child has just completed his or her first important exam in 2019. The teachers in schools had gone through and probably also returned the papers for you to look through and sign over the weekends. Some parents had a nasty shock when they found out that their children had done very badly or badly for the CA1 exams. Some parents would be overjoyed to find out that their children had improved greatly since the last exam. Other than the effort put in and the progress made in learning by a child, there can be other reasons as in why a child has done better, much better, worse or very badly in different exam. For example, the emotional aspect of a student during a period of time, changes in the learning environment or even teachers. As CA1 is a school-based exam, the levels of difficulties in papers of different schools can vary and an “easy” or “tough” paper can determine to a large extent how a child performs too. A student getting average results for a tough paper does not mean that his academic progress has got worse. Likewise, a student getting good results for an easy paper might not necessarily mean that he has really improved. Generally, there is also a difference in difficulty level between P5 and P6 papers. This is especially true in the transition from P4 to P5 papers for all subjects. The bigger gap in difficulty level and change in format of papers has caused the results of many students to drop or even plunge when they take their first P5 papers. Many students are not used to the rigours of doing upper primary papers in terms of difficulty level and duration. Suddenly, some students have changed from “high progress” learners to “low progress” learners. Even the awarding of marks can be stricter when it comes to P6 papers since it is the PSLE year and teachers want their students to learn to answer questions the “PSLE way”. Therefore, do not get over alarmed when your child suddenly gets lower marks or overconfident when he or she gets higher marks. Find out from your child how he or she fared in comparison with his or her peers, if possible. Some time, the teacher might give some hints to the class too whether the paper is a tough one or not and how the whole level has fared generally. Take a look at the difficulty level of the papers before you decide if your child has really improved a lot or not. After considering the above-mentioned factors, then review the results and how well your child has understood the concepts/skills he has learnt thus far. The purpose of reviewing after CA1 is critical. It identifies any gaps in learning soon so that actions can be taken to nip any problems in the bud quickly. By the way, there are only 6 months left before PSLE! I am sure by now your child’s teachers would have done an error analysis for the papers and identified the areas of weaknesses the class would have. They would then do some re-teaching of concepts and re-test the whole class based on the areas of weaknesses. 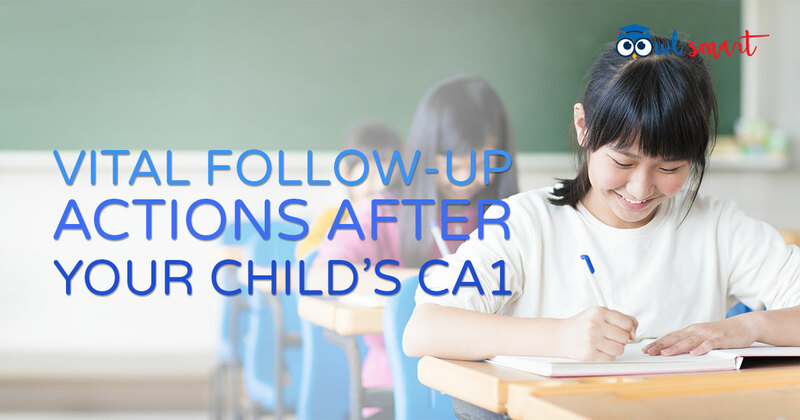 Follow-up plans would also be carried out, for example, some weaker students need to stay back for remedial lessons after CA1. For parents, after looking through the papers, it would be good to communicate with your child’s teachers to find out the areas of weaknesses your child is facing to get a more complete review of the topics, concepts or types of questions that your child needs help in. In the coming days, especially during the March holidays, spend time helping your child to relearn and practise on the areas of weaknesses identified. For example, assign practice questions based on weaknesses in topics (e.g Fractions) or concepts (e.g dividing a proper fraction by a proper fraction) or strategies ( e.g Unchanged Total). Alternatively, your child can sign up for OwlSmart's online revision tools where the questions are categorised according to level of difficulty, topics, skills or strategies. You child can have ample practices on areas of weaknesses in term of difficulty level before moving on to a higher level. Detailed explanation is also provided for almost all of the questions in our database. It is important to mention here that more time should be spent relearning areas of weaknesses rather than learning new concepts that your child has not learnt yet after CA1. Quality learning is also more important than quantity. Doing more questions does not equate to better understanding. Reviewing and learning from mistakes is more crucial. Emphasize on topics that take up a heavier weighting in a subject too. For example, when it comes to Math, Whole Numbers and Fractions are two very important topics with a lot of strategies involved. The concept of part-whole is first learnt in these two topics. Build up the fundamentals first in these two topics before proceeding to other part-whole topics like ratio and percentage. Understanding the basic concepts in these two topics will help a student to understand ratio and percentage more easily too. In short, it is vital to carry out remediating action after CA1. Identify the gaps in learning and correct them. Before you realise it, 6 months will pass by quickly and PSLE is approaching. If misconceptions or gaps in learning are not addressed quickly and properly, most likely the mistakes will be repeated in the next exam and worse still, learning of new concepts which build on the previous concepts, will be affected as well.